In 1961, the Space Race between the United States and the USSR was in full swing and President Kennedy vowed the the US would have a man on the moon by the end of the decade. Mission Control, This is Apollo takes a look at the 12 Gemini and 17 Apollo space missions in the 1960s and '70s. 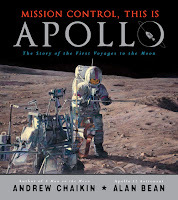 Author Andrew Chaikin provides a detailed look at each manner mission complete with photos and paintings by Apollo 12 astronaut Alan Bean. In addition to detailed descriptions of the missions and astronauts, Chaikin includes sections describing life in space. From going to the bathroom to designing space suits to creating meals on the moon, these sections give readers a glimpse into the life of an astronaut in space. This will be a valuable addition to library shelves as kids look for research material about America's missions to the moon. This book will also make great browsing material for any kid with aspirations to leave the Earth's orbit someday. A detailed list of further resources is a great addition to the book. It also includes an index an author's note, and a note from Alan Bean on creating the paintings that were included in the book. Pair this one with Team Moon, Almost Astronauts, Reaching For the Moon, and Moonshot for an astronaut endcap. Check out other reviews at Literate Lives, The National Space Society, and Bookends. And hey, Happy Nonfiction Monday! You can find the roundup over at Bookends this week.